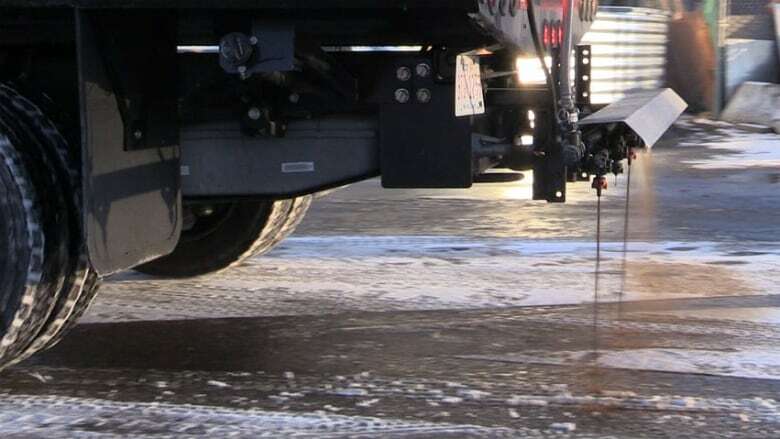 Calgary is expanding its use of beet juice as an anti-icing agent on roads. It had previously used the organic compound on a trial basis but is now ramping that up, as a new winter storm approaches. The beet juice is mixed with brine to create a fluid that sticks to the road and breaks down the bonds between snow and ice and the road's surface, said Jim Fraser, a district manager with the city's roads department. The beet-brine mixture was previously tested in small amounts but Fraser said the city is now conducting a much larger trial on streets and on the cycle tracks. That trial includes a new tank that can hold 40,000 litres of beet juice and supply a two-ton drip-truck to spray the mixture. The beet mixture has been used elsewhere in Canada, and Fraser said it has proven effective for snow and ice control. "The small tests we have done in the past have been very promising," he said. "We are hoping by doing a larger trial, we can really see the benefits this year." Beet juice a slippery street solution in La Broquerie, Man.